The Detroit Fire Department (DFD) provides fire protection and emergency medical services to the city of Detroit, Michigan, United States. The Detroit Fire Department currently operates 47 fire companies out of 34 fire stations located throughout the city, with a total sworn personnel complement of 830 firefighters in all ranks. 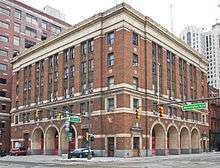 The Detroit Fire Headquarters was once located on Larned Street in Downtown Detroit. On July 8, 2013, the headquarters moved to the Detroit Public Safety Headquarters on 3rd street. The building, a former MGM Grand Casino hosts fire, police, EMS, and additional services. The Detroit Fire Department responds to approximately 165,000 emergency calls annually, with over 80% being medical emergencies and approximately 9,000 working structural fires. Until December 31, 2013, the Detroit Fire Department was led by Fire Commissioner Donald R. Austin, a former member of the Los Angeles Fire Department and a Detroit native. Austin came to Detroit in May 2011 on the difficult mission to bring change to the Detroit Fire Department. In November 2013 he resigned due to changes in city administration. Austin had kicked off a reform of the department, which will have to be fulfilled by his successor. The new mayor of Detroit, Mike Duggan, named Jonathan Jackson, a 25-year veteran of the department, and a Second Deputy Fire Commissioner under Austin, as the Interim Fire Commissioner on December 23, 2013. Craig Dougherty, a former member of Engine 50 on the city's East Side and Fire Chief under Austin, became a Second Deputy Commissioner under Jackson. The administration was rounded out by Deputy Commissioner Edsel Jenkins, C.P.A., Second Deputy Commissioner Sydney Zack, LL.M., and Second Deputy Commissioner Orlando Gregory. By the end of March 2014, Commissioner Jackson resigned due to a life-threatening neural disease. On April 8, Deputy Commissioner Jenkins was named as the new Executive Fire Commissioner. The city of Detroit has to cope with a large number of fires. The numerous vacant buildings throughout the city, combined with its current economic situation, have resulted in numerous fires on a daily basis. About 85% of the fires that occur daily in Detroit occur in vacant homes and buildings. In 2011 alone, the DFD responded to over 9,000 working structural fires. A large number of these fires are believed to be "incendiary" (or arson), far above the national average of about 7.8%. There are, however, no accurate statistics for determining the arson rate in Detroit due to the fact that only a fraction of the fires can be investigated by the limited resources of the DFD Arson Unit. Only fire scenes which have been investigated can be ruled as incendiary or arson fires. Those fires which have not been investigated must be classified as "undetermined" unless an investigation is completed. It should be noted that an "Incendiary Fire" is a technical definition for "a fire that is deliberately set with the intent to cause a fire to occur in an area where the fire should not be". "Arson" is and a statutory definition for a criminal offense. There are occasions where a fire may be "incendiary", but not meet the threshold of "arson". Below is the rank structure of the Detroit Fire Department. The Detroit Fire Department is currently divided into 10 divisions of operations: Administration, Apparatus, Communications, Community Relations, Emergency Medical Services(EMS), Firefighting/Fire Suppression, Fire Marshal, Medical, Research and Development, and Training Academy. The Detroit Fire Department operates a separate EMS Division and as of 2015 Detroit Fire Fighters are now trained medical first responders and have the ability to handle patient care until EMS arrives. The EMS division operates with limited manpower. As a result, many calls are handled by DFD until a unit is available. The availability of EMS units is often compromised due to the amount of calls in a city which has a lot of violence, as well as the breaking down of the EMS rigs due to age, mileage, and lack of proper maintenance. Thanks to Mayor Bing's collaboration with the business community, Roger Penske sponsored 23 new ambulances for the department, which were put into service in the summer of 2013. In September 2013, AED devices were put in service on the fire apparatuses as a first step into performing life support to citizens as first responders. As of December 2013, there are a total of 34 fire stations in the city of Detroit, including the Fire Headquarters, organized into 8 battalions. Each battalion is commanded by a battalion chief per shift. Engine 1 1 115 W. Montcalm @ Park Ave.
Engine 9 Ladder 6 Medic 21 1 3787 E. Lafayette St. @ Mt. Elliott St.
Engine 17 Ladder 7 Chief 5 5 6100 2nd Ave. @ Burroughs St.
Engine 27 Ladder 8 Medic 19 Chief 7 7 4700 W. Fort St. @ Summit St.
Engine 29 7 7600 W. Jefferson Ave @ Solvay St.
Engine 30 Medic 3 4 16543 Meyers Rd. @ Florence St.
Engine 33 Ladder 13 7 1041 Lawndale St. @ W. Lafayette Blvd. Engine 34 2 6345 Livernois Ave @ Walton St.
Engine 35 Medic 20 5 136 Kenilworth St. & Woodward Ave.
Engine 39 Medic 1 5 8720 14th St. @ Blaine St.
Engine 40 Ladder 17 Medic 10 8 13939 Dexter Ave. @ Ewald Cir. Engine 41 Medic 14 6 5010 Rohns St. @ E. Warren Ave.
Engine 42 Ladder 21 Medic 2 2 6330 Chicago W. @ Livernois Ave.
Engine 44 Ladder 18 Chief 8 8 35 W. 7 Mile Rd. @ John R. St.
Engine 46 9 10101 Knodell St. @ Grace St.
Engine 48 Medic 11 7 2300 S. Fort St. @ Downing St.
Engine 50 Ladder 23 Medic 15 Chief 9 9 12981 Houston Whittier St. @ Gratiot Ave.
Engine 52 Ladder 31 9 5029 Manistique St. @ E. Warren Ave.
Engine 53 Ladder 25 Medic 17 4 15121 Greenfield Rd. @ Fenkell Ave.
Engine 54 Ladder 26 Medic 4 4 16825 Trinity St. @ Grand River Ave.
Engine 55 Ladder 27 Medic 5 Chief 2 2 18140 Joy Rd. @ Southfield Rd. Engine 56 Medic 16 8 18601 Ryan Rd. @ Hilldale St.
Engine 57 2 13960 Burt Rd. & Schoolcraft Ave.
Engine 58 Medic 24 Squad 6 9 10801 Whittier Ave. @ Lakepoint St.
Engine 59 Medic 22 Squad 1 Chief 4 4 17800 Curtis St. @ Southfield Rd. Engine 60 9 19701 Hoover St. @ Manning St. Ladder 14 Medic 12 6 2200 Crane St. @ Brinket Ave. Ladder 20 Medic 6 Squad 2 1 463 W. Alexandrine St. @ Cass Ave. Ladder 22 2 6830 McGraw Ave @ Martin Rd. Squad 3 6 1820 E. Grand Blvd @ Moran St.
Medic 7 Squad 4 5 1697 W. Grand Blvd. @ McGraw Ave.
Medic 18 Squad 5 8 18236 Livernois Ave. @ Curtis St.
Medic 8 Tac. 2, Haz-Mat. 1, Decon. 1 Chief 1 1 3080 Russell St. @ Wilkins St.
As of January 2011, in an effort to cut costs, the city of Detroit is considering privatizing the Fire Department's EMS Division. In addition to the permanent company closings, some units have been put out of service daily due to manpower cutbacks. 200 demotions have been made. Also, the standard response to a structural fire was cut down from a 3 engines and 1 ladder response to a 2 engines and 1 ladder response. By 2014 the fire department was using improvised tools made from soda pop cans, doorbells, door hinges, pipes, etc. to give alerts within stations. ↑ "." Retrieved on January 4, 2014. ↑ NFPA 921-Guide for Fire and Explosion Investigation, 2014 Edition. 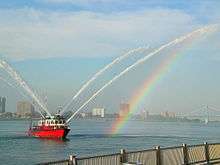 ↑ "FAQs | Fire Department | City of Detroit Departments". www.detroitmi.gov. Retrieved 2014-06-29. ↑ "About the Fire Department | City of Detroit Departments | www.detroitmi.gov". Ci.detroit.mi.us. Retrieved 2013-12-27. ↑ Baldas, Tresa. "Detroit fire department has alert system made of pop cans, doorbells" (Archive). Detroit Free Press. September 6, 2014. Retrieved on October 25, 2015. The former Fire Headquarters, located in Downtown. 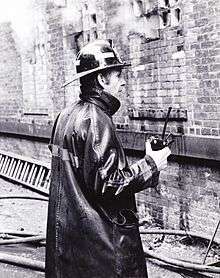 The quarters of Engine 17, Ladder 7, and Chief 5 at 6100 2nd St.
A DFD Captain overseeing a fire in 1978.